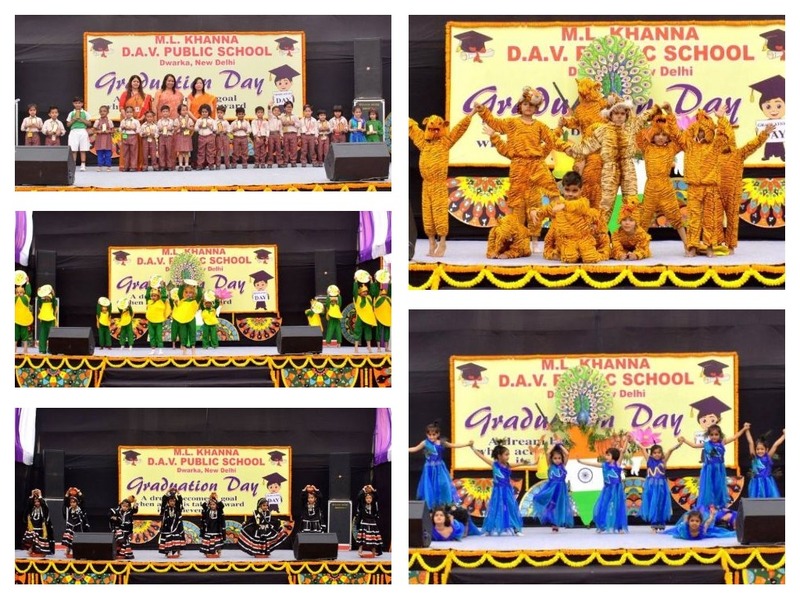 M L Khanna DAV Public School, Dwarka celebrated Graduation Day to applaud the young enthusiastic learners of class Pre-Primary for their commendable performance in the session 2018-19. The occasion was graced by Sh. Sushil Kumar, Deputy Director of Education Zone 21, Distt. South West B, Najafgarh and School Manager Ms. Adarsh Kohli. The ceremony was also attended by the parents of the students of class Pre-Primary. The celebration commenced with the ‘Sow n Grow’ welcome of the Chief Guest by Principal Ms. Monika Mehan. This was followed by lamp lighting ceremony and Saraswati Vandana to evoke the blessings of Goddess Saraswati. The gathering was then addressed by the Principal highlighting the vision of the school and role of parents and teachers in the students’ learning process. After this, the graceful dancers of kindergarten gave a mesmerising performance on the theme Colours of India where the folk dances of Manipur, Maharashtra and Rajasthan were presented and left everyone spellbound. Another heart stealing performance was the presentation of Graduation Song. Parent representatives also shared their reflections. The Chief Guest addressed the gathering and stressed on the importance of being patient and receptive with their children. The most important part of the day was the felicitation of young graduates wherein the delighted tiny tots of Pre-Primary dressed in Graduation robes and capes walked the stage. Dwarkadheers were felicitated with certificates of graduation and trophies. The programme culminated with the vote of thanks by the Supervisory Head of Kindergarten. It was indeed a joyous and memorable day for the little ones and their parents. 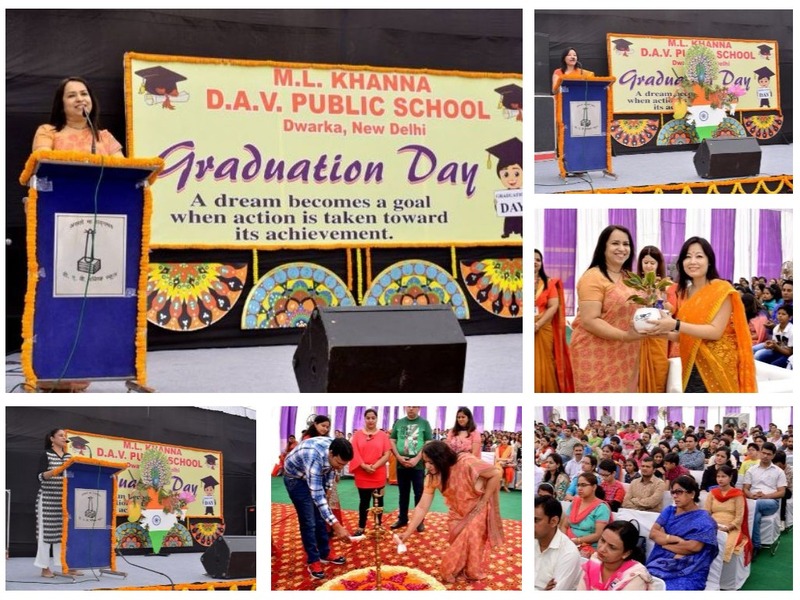 M L Khanna DAV Public School, Dwarka organised Graduation Ceremony for the young and enthusiastic learners of Pre Primary on 19th March 2018. The occasion was graced by Ms.Ghanapriya Elangbam, Country Coordinator for India Generation Global, a project of Tony Blair Faith Foundation. The celebration commenced with the ‘sow and grow’ welcome of the Chief Guest by school Principal Ms. Monika Mehan. It was followed by lamp lighting and Saraswati Vandana to evoke the blessings of Goddess Saraswati. Principal, in her address, highlighted the vision of the school and role of parents and teachers in the students’ learning process. Parent representatives expressed their gratitude towards the school and the teachers in instilling humility and self esteem in their children through varied spectrum of activities. After this, the graceful dancers of Kindergarten left everyone spell bound with their mesmerising Rajasthani Folk dance. Another heart stealing performance was the presentation of National Symbols of India which fuelled the spirit of patriotism in everyone present. The Chief Guest addressed the gathering and stressed on the importance of being patient and receptive with the children. The most important part of the day- Graduation Ceremony began with the tiny tots of Pre Primary dressed in Graduation robes and caps walking the stage. The Principal and the Chief Guest felicitated the students with trophies and certificates of graduation. Super achievers of the session 2017-18 were applauded and felicitated for their commendable performance in the year. The programme concluded with the vote of thanks by the Supervisory Head of Kindergarten. “Graduation is an exciting time. It is both an ending and a beginning. It is warm memories of the past and big dreams for the future”. The school organised Graduation Ceremony for the students of class Pre Primary on 16th March 2017. The Chief Guest on the occasion was Dr. Sharda Kumari, senior lecturer DIET (SCERT). The event commenced with the lighting of the lamp by the Chief Guest and Principal Monika Mehan. The principal welcomed the gathering and inspired the students with her words of wisdom. The Pre Primary students performed on a peppy number and left everybody spell bound with their mesmerizing performance. Another show stealing performance was the Dumble Drill presented by the little stars of the Kindergarten. The Chief Guest, Dr. Sharda Kumari, addressed the gathering and advised the parents to be patient with children and lead them by example. Her invigorating words enlightened the audience. The most important part of the day- Graduation Ceremony started with the smart and tiny tots of pre primary dresses in graduation robes and caps walking the stage. The principal felicitated the students with Certificate of Graduation. Children looked all pretty in their graduation robes and caps. The programme ended with the vote of thanks by the Supervisory Head of Kindergarten. It was indeed a joyous and memorable day for the little ones as they received their Graduation Certificates from the guests. 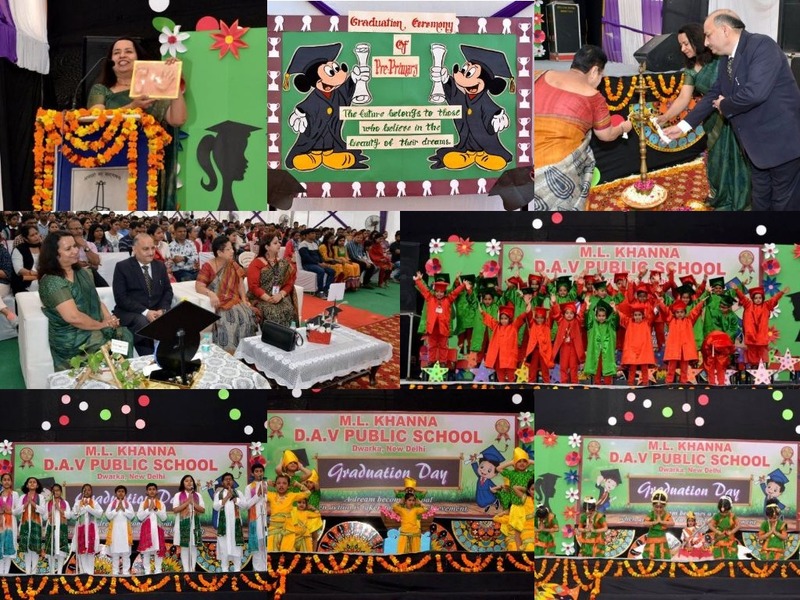 The school organized Graduation Day for the Pre Primary students. The event was graced by Ms. Anita Chopra, Principal, DAV Public School R K Puram. The eventful day started with the ceremonial lamp lighting by the Chief Guest and Principal Ms. Monika Mehan. The programme began with a Welcome Song presented by the teachers of Kindergarten which was written and composed by the school faculty in association with the music department of the school. It was indeed a befitting welcome to the august gathering. The Pre Primary students left everybody spell bound with their mesmerizing dance performance. Vibrant music, dance, breathtaking colours and highly coordinated movements promptly set the tone and mood of the atmosphere. Their energetic booming and clapping coaxed the audience to sway to its lively beats. Another show stealing performance was the puppet show coordinated by the Kindergarten teachers. Principal Ms. Monika Mehan addressed the gathering and emphasized upon the overall development of the students through various co-curricular activities. The most important part of the day -Graduation Ceremony started with the Pre Primary students adorned in convocation capes walking the stage. Their smiling faces were welcomed by rapturous applause from the audience as they received scrolls of merit on the dais. The programme ended with the vote of thanks by the Supervisory Head of Kindergarten. 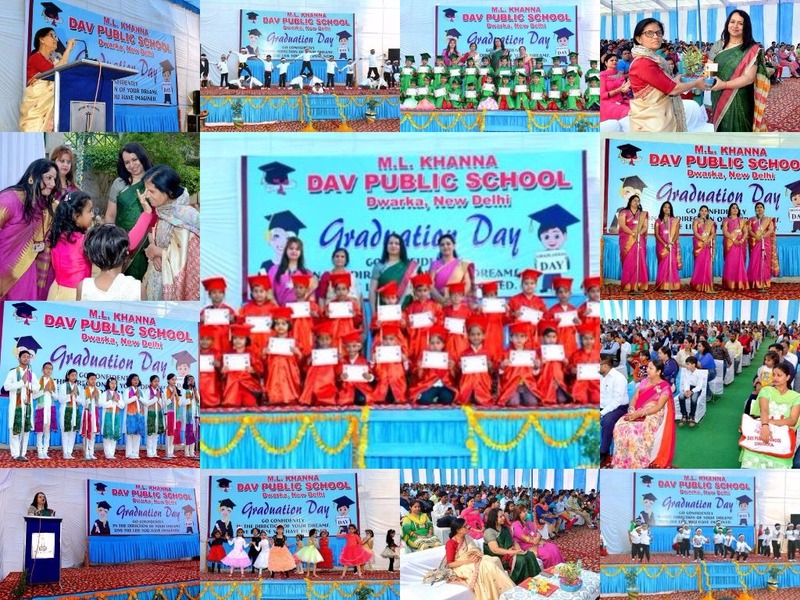 DAV Public School, Dwarka organised Graduation Day for the students of class Pre Primary on 21st March 2015. Ms Chitra Nakra, Principal Veda Vyasa DAV Public School,Vikaspuri graced the occasion as the Chief Guest. The event began with lighting of lamp by the chief guest and Principal Ms Monika Mehan. In her address, Ms Chitra Nakra advised the parents to be patient with children and lead them by example. Her words of wisdom enlightened the audience. The little angels of class Pre Primary performed on a peppy number expressing their joy on graduating to main school. The Pre Primary Incharge presented a month wise school report highlighting the major activities that took place during the session. Ranveer Poddar of Pre Primary Swan recited a poem expressing his joyous experiences of school life while Hardik Tiwari of Pre Primary Dove expressed his gratitude towards his parents and teachers for their care and concern. While addressing the gathering, Ms Swarolipi Mitra, mother of Ena Mitra; Mr Ravindra Singh, father of Akhya Singh; and Ms Kirti Jain, mother of Atishay Jain appreciated the efforts taken by the school and teachers to provide holistic development to the children. The Principal Ms. Monika Mehan felicitated the students with Appreciation Certificates and Certificate of Graduation. Children looked all pretty in their graduation gowns and caps.